The Homestead has had some TLC recently, and it shows. Boy Scouts grew and planted native dogwoods along the Sense of Wonder Trail. 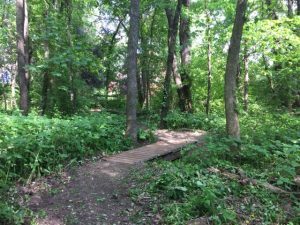 The trail has been groomed, and the footbridge replaced. There’s now an opportunity to invest in trail signs which can be dedicated in honor as you choose. New signs will replace the aged ones which guide you through areas where Rachel likely discovered some of the same bird species you’ll meet. 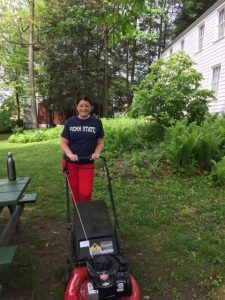 We welcome volunteers – individual, groups, from organizations and companies to spend a few hours or a day in caring for the Homestead. 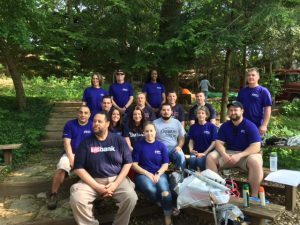 In preparation for celebrating the 110th anniversary of Rachel’s birthday, a group of volunteers from US Bank came and worked – along with PA DEP and some friends, resulting in a great makeover. Contact us to schedule a “Day of Caring” from your organization or company. 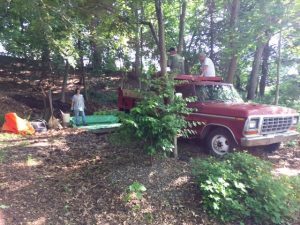 Two long-time volunteers organized the tasks, tool lists, and everyone showed up ready for a change of pace. 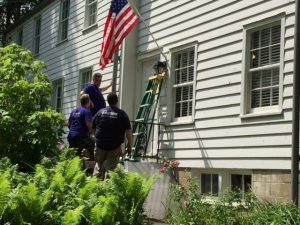 Below – the team gets an orientation and then to work, using their skills both inside the house and outside. It is always invigorating to meet giving people who care about Rachel’s legacy and join in becoming part of it.